This 2019 Ford F-150 XLT is proudly offered by Cypress Motors This Ford includes: TRAILER TOW PACKAGE Trip Computer Tow Hitch XTR PACKAGE Chrome Wheels Tires - Rear All-Terrain Tow Hooks Running Boards/Side Steps Tires - Front All-Terrain PRO TRAILER BACKUP ASSIST Trip Computer MEDIUM EARTH GREY, CLOTH 40/20/40 FRONT SEAT Split Bench Seat Cloth Seats Power Passenger Seat Power Driver Seat Passenger Adjustable Lumbar Driver Adjustable Lumbar ELECTRONIC LOCKING Locking/Limited Slip Differential TRANSMISSION: ELECTRONIC 10-SPEED AUTOMATIC Transmission w/Dual Shift Mode A/T 10-Speed A/T EQUIPMENT GROUP 301A MID Integrated Turn Signal Mirrors Power Mirror(s) Privacy Glass Heated Mirrors Leather Steering Wheel Power Driver Seat Adjustable Pedals Passenger Adjustable Lumbar Driver Adjustable Lumbar LED BOX LIGHTING INTEGRATED TRAILER BRAKE CONTROLLER REMOTE START SYSTEM Remote Engine Start TIRES: LT275/65R18C OWL Tires - Rear All-Terrain Tires - Front All-Terrain ENGINE: 2.7L V6 ECOBOOST V6 Cylinder Engine Gasoline Fuel Turbocharged BLUE JEANS METALLIC *Note - For third party subscriptions or services, please contact the dealer for more information. * You deserve a vehicle designed for higher expectations. This Ford F-150 delivers with a luxurious, well-appointed interior and world-class engineering. This 4WD-equipped vehicle will handle beautifully on any terrain and in any weather condition your may find yourself in. The benefits of driving a 4 wheel drive vehicle, such as this Ford F-150 XLT, include superior acceleration, improved steering, and increased traction and stability. Beautiful color combination with Blue Jeans Metallic exterior over Medium Earth Grey interior making this the one to own! Contact Cypress Motors today for information on dozens of vehicles like this 2019 Ford Ranger XLT. This Ford includes: TRAILER TOW PACKAGE Tow Hitch INGOT SILVER METALLIC 5" RECTANGULAR BLACK RUNNING BOARDS Running Boards/Side Steps XLT SPORT APPEARANCE PACKAGE Aluminum Wheels EQUIPMENT GROUP 302A LUXURY Multi-Zone A/C Steering Wheel Audio Controls Remote Engine Start Smart Device Integration Aluminum Wheels A/C Sliding Rear Window Power Mirror(s) Climate Control Privacy Glass Auto-Dimming Rearview Mirror Leather Steering Wheel Power Passenger Seat Rear Defrost Power Driver Seat Heated Front Seat(s) Satellite Radio Passenger Adjustable Lumbar Bluetooth Connection Telematics Auxiliary Audio Input Power Folding Mirrors Driver Adjustable Lumbar MP3 Player LIGHT STONE/EBONY, FRONT PREMIUM CLOTH BUCKET SEATS Cloth Seats Driver Adjustable Lumbar Bucket Seats TRANSMISSION: ELECTRONIC 10-SPEED SELECTSHIFT AUTO (STD) Transmission w/Dual Shift Mode A/T 10-Speed A/T *Note - For third party subscriptions or services, please contact the dealer for more information. * Equipped with 4WD, this Ford Ranger gives you added confidence to tackle the surface of any path you take. Just what you've been looking for. With quality in mind, this vehicle is the perfect addition to take home. This is the one. Just what you've been looking for. This 2019 Ford F150 4X4 s/crew XLT/XTR series is located in Maple Creek, Sk., Options on this unit are: rear defroster, 8-way power drivers seat, trailer tow pkg., remote start system, 6" chrome running boards, 18" chrome-like PVD wheels and much more., Located at Maple Creek, Sk. contact Cory or Dale at 1-877-662-2617 or email them at cpenner@cypressmotors.com or dlockard@cypressmotors.com . We Finance! On site Banking Solutions! Ford Maintenance Protection Plan and Extended Ford Protect Plans Available One Stop Shop with Sales and Service. Serving Southwest Sk. for 45 years. Contact Cypress Motors today for information on dozens of vehicles like this 2019 Ford F-150 XLT. This Ford includes: TRAILER TOW PACKAGE Trip Computer Tow Hitch XTR PACKAGE Chrome Wheels Tires - Rear All-Terrain Tow Hooks Running Boards/Side Steps Tires - Front All-Terrain PRO TRAILER BACKUP ASSIST Trip Computer MEDIUM EARTH GREY, CLOTH 40/20/40 FRONT SEAT Split Bench Seat Cloth Seats Power Passenger Seat Power Driver Seat Passenger Adjustable Lumbar Driver Adjustable Lumbar 3.31 AXLE RATIO TRANSMISSION: ELECTRONIC 10-SPEED AUTOMATIC Transmission w/Dual Shift Mode A/T 10-Speed A/T ENGINE: 5.0L V8 Flex Fuel Capability 8 Cylinder Engine EQUIPMENT GROUP 301A MID Integrated Turn Signal Mirrors Power Mirror(s) Privacy Glass Heated Mirrors Leather Steering Wheel Power Driver Seat Adjustable Pedals Passenger Adjustable Lumbar Driver Adjustable Lumbar INTEGRATED TRAILER BRAKE CONTROLLER REMOTE START SYSTEM Remote Engine Start TIRES: LT275/65R18C OWL Tires - Rear All-Terrain Tires - Front All-Terrain OXFORD WHITE SKID PLATES *Note - For third party subscriptions or services, please contact the dealer for more information. * There's a level of quality and refinement in this Ford F-150 that you won't find in your average vehicle. Take home this Ford F-150 XLT, and you will have the power of 4WD. It's a great feature when you need to drive over tricky terrain or through inclement weather. This 2019 Ford F-150 XLT is proudly offered by Cypress Motors This Ford includes: BLACK, SPORT CLOTH 40/CONSOLE/40 FRONT-SEATS Cloth Seats Power Passenger Seat Power Driver Seat Passenger Adjustable Lumbar Driver Adjustable Lumbar Bucket Seats TRAILER TOW PACKAGE Trip Computer Tow Hitch PRO TRAILER BACKUP ASSIST Trip Computer ELECTRONIC LOCKING Locking/Limited Slip Differential TRANSMISSION: ELECTRONIC 10-SPEED AUTOMATIC Transmission w/Dual Shift Mode A/T 10-Speed A/T 110V/400W OUTLET REVERSE SENSING SYSTEM Rear Parking Aid ENGINE: 5.0L V8 Flex Fuel Capability 8 Cylinder Engine EQUIPMENT GROUP 301A MID Integrated Turn Signal Mirrors Power Mirror(s) Privacy Glass Heated Mirrors Leather Steering Wheel Power Driver Seat Adjustable Pedals Passenger Adjustable Lumbar Driver Adjustable Lumbar LED BOX LIGHTING VELOCITY BLUE INTEGRATED TRAILER BRAKE CONTROLLER TIRES: LT275/65R18C OWL Tires - Rear All-Terrain Tires - Front All-Terrain *Note - For third party subscriptions or services, please contact the dealer for more information. * Pull up in the vehicle and the valet will want to parked on the front row. This Ford F-150 is the vehicle others dream to own. Don't miss your chance to make it your new ride. Handle any terrain with ease thanks to this grippy 4WD. Whether you're on a slick pavement or exploring the back country, you'll be able to do it with confidence. You've found the one you've been looking for. Your dream car. You can find this 2019 Ford F-150 XLT and many others like it at Cypress Motors. This Ford includes: XLT SPORT APPEARANCE PACKAGE Tires - Front All-Season Aluminum Wheels Running Boards/Side Steps Tires - Rear All-Season PRO TRAILER BACKUP ASSIST Trip Computer TRAILER TOW PACKAGE Trip Computer Tow Hitch 3.31 AXLE RATIO ENGINE: 3.5L V6 ECOBOOST V6 Cylinder Engine Gasoline Fuel Turbocharged TRANSMISSION: ELECTRONIC 10-SPEED AUTOMATIC Transmission w/Dual Shift Mode A/T 10-Speed A/T 110V/400W OUTLET XLT SPORT APPEARANCE PACKAGE Tires - Front All-Season Aluminum Wheels Running Boards/Side Steps Tires - Rear All-Season EQUIPMENT GROUP 301A MID Integrated Turn Signal Mirrors Power Mirror(s) Privacy Glass Heated Mirrors Leather Steering Wheel Power Driver Seat Adjustable Pedals Passenger Adjustable Lumbar Driver Adjustable Lumbar ELECTRONIC LOCKING Locking/Limited Slip Differential FX4 OFF-ROAD PACKAGE INTEGRATED TRAILER BRAKE CONTROLLER INFLATABLE REAR SAFETY BELTS Seatbelt Air Bag WHEELS: 18" 6-SPOKE MACHINED-ALUMINUM Aluminum Wheels OXFORD WHITE BLACK, SPORT CLOTH 40/CONSOLE/40 FRONT-SEATS Cloth Seats Power Passenger Seat Power Driver Seat Passenger Adjustable Lumbar Driver Adjustable Lumbar Bucket Seats BOXLINK CARGO MANAGEMENT SYSTEM POWER-SLIDING REAR WINDOW SKID PLATES *Note - For third party subscriptions or services, please contact the dealer for more information. * Today's luxury vehicle is not just about opulence. It's about a perfect balance of performance, comfort and attention to detail. This 2019 Ford F-150 is the perfect example of the modern luxury. Equipped with 4WD, this Ford F-150 gives you added confidence to tackle the surface of any path you take. Just what you've been looking for. With quality in mind, this vehicle is the perfect addition to take home. This 2019 Ford F-150 XLT is proudly offered by Cypress Motors This Ford includes: BLACK, SPORT CLOTH 40/CONSOLE/40 FRONT-SEATS Cloth Seats Power Passenger Seat Power Driver Seat Passenger Adjustable Lumbar Driver Adjustable Lumbar Bucket Seats ELECTRONIC LOCKING Locking/Limited Slip Differential EQUIPMENT GROUP 302A LUXURY Remote Engine Start Integrated Turn Signal Mirrors Chrome Wheels Power Mirror(s) Rear Parking Aid Heated Mirrors Leather Steering Wheel Power Passenger Seat Power Driver Seat Heated Front Seat(s) Trip Computer Tires - Rear All-Terrain Tow Hooks Tow Hitch Adjustable Pedals Passenger Adjustable Lumbar Running Boards/Side Steps Driver Adjustable Lumbar Tires - Front All-Terrain TRANSMISSION: ELECTRONIC 10-SPEED AUTOMATIC Transmission w/Dual Shift Mode A/T 10-Speed A/T XLT SPORT APPEARANCE PACKAGE Tires - Front All-Season Aluminum Wheels Running Boards/Side Steps Tires - Rear All-Season ENGINE: 5.0L V8 Flex Fuel Capability 8 Cylinder Engine INTEGRATED TRAILER BRAKE CONTROLLER AGATE BLACK HIGH INTENSITY LED SECURITY APPROACH LAMPS TIRES: LT275/65R18C OWL Tires - Rear All-Terrain Tires - Front All-Terrain TAILGATE STEP W/TAILGATE LIFT ASSIST *Note - For third party subscriptions or services, please contact the dealer for more information. * Pull up in the vehicle and the valet will want to parked on the front row. This Ford F-150 is the vehicle others dream to own. Don't miss your chance to make it your new ride. Where do you want to go today? With 4WD, you can choose to drive virtually anywhere and on terrain 2WD vehicles can't handle. 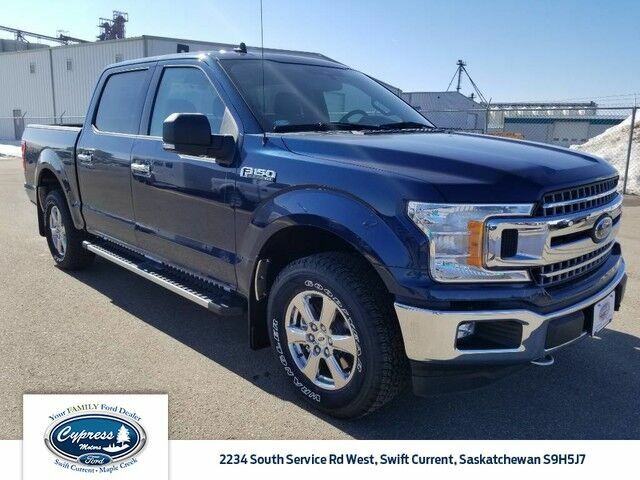 This 2019 Ford F-150 4X4 Supercrew 145"WB XLT series is located in Maple Creek, SK. option on this unit are boxlink cargo system, power sliding rear window, rear defroster, remote start system, reverse sensing system, 110V/400W outlet, LED box lighting, trailer tow pkg., manual folding mirror with power glass, 18'" 6- spoke mach-alum wheels, and much more. Located at Maple Creek, Sk. contact Cory or Dale at 1-877-662-2617 or email them at cpenner@cypressmotors.com or dlockard@cypressmotors.com . We Finance! On site Banking Solutions! Ford Maintenance Protection Plan and Extended Ford Protect Plans Available One Stop Shop with Sales and Service. Serving Southwest Sk. for 45 years. This 2019 FORD F150 4X4 S/Crew-145"WB, 5.0L V8, electronic 10-SPD auto, XLT series with a XLT SPORT PKG., is located in Maple Creek, Sk. Options on this unit are: power sliding rear window, rear defroster, remote start system, reverse sensing system, 110V/400W outlet LED box lighting, boxlink cargo sys., 3.55 electronic lock RR axle, tray style floor liner, trailer tow pkg., manual fold mirror with power glass LED side-mirror spot lights, tailgate step, integrated trailer brake control, 18" 6-spoke mach-alum wheels, 40/console/40 sport cloth seats and much more. Located at Maple Creek, Sk. contact Cory or Dale at 1-877-662-2617 or email them at cpenner@cypressmotors.com or dlockard@cypressmotors.com . We Finance! On site Banking Solutions! Ford Maintenance Protection Plan and Extended Ford Protect Plans Available One Stop Shop with Sales and Service. Serving Southwest Sk. for 45 years. This 2019 Ford F-150 4x4 supercrew Lariat series is Located in Maple Creek,SK.,options on this unit are XTR pkg., Rear Defroster, 8-way power drivers seat, Boxlink cargo system, Pro. trailer backup assist, Tray style floor liner, Trailer tow pkg., Manual fold w/power glass mirror, Remote start system, Integrated trailer brake control, Reverse sensing system, Located at Maple Creek, Sk. contact Cory or Dale at 1-877-662-2617 or email them at cpenner@cypressmotors.com or dlockard@cypressmotors.com . We Finance! On site Banking Solutions! Ford Maintenance Protection Plan and Extended Ford Protect Plans Available One Stop Shop with Sales and Service. Serving Southwest Sk. for 45 years. Contact Cypress Motors today for information on dozens of vehicles like this 2019 Ford F-150 XLT. This Ford includes: BLACK, SPORT CLOTH 40/CONSOLE/40 FRONT-SEATS Cloth Seats Power Passenger Seat Power Driver Seat Passenger Adjustable Lumbar Driver Adjustable Lumbar Bucket Seats ELECTRONIC LOCKING Locking/Limited Slip Differential EQUIPMENT GROUP 302A LUXURY Remote Engine Start Integrated Turn Signal Mirrors Chrome Wheels Power Mirror(s) Rear Parking Aid Heated Mirrors Leather Steering Wheel Power Passenger Seat Power Driver Seat Heated Front Seat(s) Trip Computer Tires - Rear All-Terrain Tow Hooks Tow Hitch Adjustable Pedals Passenger Adjustable Lumbar Running Boards/Side Steps Driver Adjustable Lumbar Tires - Front All-Terrain TRANSMISSION: ELECTRONIC 10-SPEED AUTOMATIC Transmission w/Dual Shift Mode A/T 10-Speed A/T XLT SPORT APPEARANCE PACKAGE Tires - Front All-Season Aluminum Wheels Running Boards/Side Steps Tires - Rear All-Season ENGINE: 5.0L V8 Flex Fuel Capability 8 Cylinder Engine INTEGRATED TRAILER BRAKE CONTROLLER HIGH INTENSITY LED SECURITY APPROACH LAMPS WHEELS: 20" 6-SPOKE PREMIUM PAINTED ALUMINUM Aluminum Wheels TIRES: P275/55R20 OWL Tires - Front Performance Conventional Spare Tire Tires - Rear Performance OXFORD WHITE TAILGATE STEP W/TAILGATE LIFT ASSIST *Note - For third party subscriptions or services, please contact the dealer for more information. * You appreciate the finer things in life, the vehicle you drive should not be the exception. Style, performance, sophistication is in a class of its own with this stunning Ford F-150. This 4WD-equipped vehicle will handle beautifully on any terrain and in any weather condition your may find yourself in. The benefits of driving a 4 wheel drive vehicle, such as this Ford F-150 XLT, include superior acceleration, improved steering, and increased traction and stability. Just what you've been looking for. With quality in mind, this vehicle is the perfect addition to take home. This 2019 Ford F-150 XLT is proudly offered by Cypress Motors This Ford includes: BLACK, SPORT CLOTH 40/CONSOLE/40 FRONT-SEATS Cloth Seats Power Passenger Seat Power Driver Seat Passenger Adjustable Lumbar Driver Adjustable Lumbar Bucket Seats ELECTRONIC LOCKING Locking/Limited Slip Differential EQUIPMENT GROUP 302A LUXURY Remote Engine Start Integrated Turn Signal Mirrors Chrome Wheels Power Mirror(s) Rear Parking Aid Heated Mirrors Leather Steering Wheel Power Passenger Seat Power Driver Seat Heated Front Seat(s) Trip Computer Tires - Rear All-Terrain Tow Hooks Tow Hitch Adjustable Pedals Passenger Adjustable Lumbar Running Boards/Side Steps Driver Adjustable Lumbar Tires - Front All-Terrain TRANSMISSION: ELECTRONIC 10-SPEED AUTOMATIC Transmission w/Dual Shift Mode A/T 10-Speed A/T XLT SPORT APPEARANCE PACKAGE Tires - Front All-Season Aluminum Wheels Running Boards/Side Steps Tires - Rear All-Season ENGINE: 5.0L V8 Flex Fuel Capability 8 Cylinder Engine INTEGRATED TRAILER BRAKE CONTROLLER HIGH INTENSITY LED SECURITY APPROACH LAMPS TIRES: LT275/65R18C OWL Tires - Rear All-Terrain Tires - Front All-Terrain RUBY RED METALLIC TINTED CLEARCOAT TAILGATE STEP W/TAILGATE LIFT ASSIST *Note - For third party subscriptions or services, please contact the dealer for more information. * You appreciate the finer things in life, the vehicle you drive should not be the exception. Style, performance, sophistication is in a class of its own with this stunning Ford F-150. This vehicle comes with 4WD for better traction on unstable surfaces, like snow and dirt to give you the edge over anything you might encounter on the road. This 2019 Ford F-150 4X4 Supercrew 145"WB XLT/XTR Series is located in Maple Creek, Sk. Option on this unit are Power sliding rear window, rear defroster, remote start, reverse sensing system, LED box lighting, 110V/400W outlet, boxlink cargo system, 6" chrome running boards, cloth bucket seats w/console, voice-activated navigation, trailer tow pkg., tailgate step, manual fold mirror w/power glass, and much more. Located at Maple Creek, SK., Contact Cory Or Dale at 1-877-662-2617, 306-662-2617, or email them at cpenner@cypressmotors.com or dlockard@cypressmotor.com . We Finance! On site banking solutions! Ford Maintenance Protection Plan and Extended Ford Protect Plans available. One stop shop with sales and service. Serving Southwest, SK. For 45 years. This 2019 Ford Ranger LARIAT is proudly offered by Cypress Motors This Ford includes: SABER METALLIC LARIAT SPORT APPEARANCE PACKAGE Aluminum Wheels Tires - Rear All-Terrain Tires - Front All-Terrain TRAILER TOW PACKAGE Tow Hitch TRANSMISSION: ELECTRONIC 10-SPEED SELECTSHIFT AUTO (STD) Transmission w/Dual Shift Mode A/T 10-Speed A/T 5" RECTANGULAR BLACK RUNNING BOARDS Running Boards/Side Steps WHEELS: 18" MACHINED ALUMINUM W/MAGNETIC POCKETS Aluminum Wheels EQUIPMENT GROUP 501A MID Variable Speed Intermittent Wipers Remote Engine Start HD Radio Navigation System Intermittent Wipers Adaptive Cruise Control AM/FM Stereo Satellite Radio Premium Sound System Cruise Control Rain Sensing Wipers LIGHT STONE/EBONY, FRONT HEATED LEATHER-TRIMMED BUCKET SEATS Power Passenger Seat Power Driver Seat Heated Front Seat(s) Passenger Adjustable Lumbar Leather Seats Driver Adjustable Lumbar Bucket Seats FX4 OFF-ROAD PACKAGE Locking/Limited Slip Differential Tow Hooks *Note - For third party subscriptions or services, please contact the dealer for more information. * There's a level of quality and refinement in this Ford Ranger that you won't find in your average vehicle. Tackle any terrain with this 4WD Ford Ranger LARIAT. Off the road or on the parkway, you'll drive with confidence no matter the weather conditions or landscape. Marked by excellent quality and features with unmistakable refined leather interior that added value and class to the Ford Ranger Enjoy the drive without worrying about directions thanks to the built-in navigation system. This 2019 Ford F-150 4X4 SuperCrew 145"WB LARIAT series is located in Maple Creek, Sk. Option on this unit are leather trimmed bucket front seats, 6" chrome running board, integrated trailer brake control, and much more. Located at Maple Creek, Sk. contact Cory or Dale at 1-877-662-2617 or email them at cpenner@cypressmotors.com or dlockard@cypressmotors.com . We Finance! On site Banking Solutions! Ford Maintenance Protection Plan and Extended Ford Protect Plans Available One Stop Shop with Sales and Service. Serving Southwest Sk. for 45 years. Contact Cypress Motors today for information on dozens of vehicles like this 2019 Ford F-150 LARIAT. This Ford includes: TRANSMISSION: ELECTRONIC 10-SPEED AUTOMATIC Transmission w/Dual Shift Mode A/T 10-Speed A/T EQUIPMENT GROUP 502A LUXURY Heated Rear Seat(s) Variable Speed Intermittent Wipers Integrated Turn Signal Mirrors Chrome Wheels Navigation System Power Mirror(s) Heated Steering Wheel Intermittent Wipers Universal Garage Door Opener Heated Mirrors AM/FM Stereo Adjustable Steering Wheel Satellite Radio Tow Hooks Blind Spot Monitor Premium Sound System Power Folding Mirrors Cross-Traffic Alert Running Boards/Side Steps Rain Sensing Wipers BLACK, LEATHER-TRIMMED BUCKET SEATS Cooled Front Seat(s) Seat Memory Power Passenger Seat Power Driver Seat Heated Front Seat(s) Passenger Adjustable Lumbar Leather Seats Driver Adjustable Lumbar Bucket Seats LARIAT SPORT APPEARANCE PACKAGE Aluminum Wheels Running Boards/Side Steps ENGINE: 2.7L V6 ECOBOOST V6 Cylinder Engine Gasoline Fuel Turbocharged TIRES: LT275/65R18C OWL Tires - Rear All-Terrain Tires - Front All-Terrain TAILGATE STEP W/TAILGATE LIFT ASSIST INTEGRATED TRAILER BRAKE CONTROLLER AGATE BLACK 3.55 AXLE RATIO (STD) *Note - For third party subscriptions or services, please contact the dealer for more information. * There's a level of quality and refinement in this Ford F-150 that you won't find in your average vehicle. When Ford created this vehicle with 4 wheel drive, they immediately enhanced the performance ability. Easily switch between two and four wheel drive to take advantage of the improved steering and superior acceleration. Added comfort with contemporary style is the leather interior to heighten the quality and craftsmanship for the Ford F-150 Enjoy the drive without worrying about directions thanks to the built-in navigation system. This 2019 Ford F-150 LARIAT is offered to you for sale by Cypress Motors. This Ford includes: TRANSMISSION: ELECTRONIC 10-SPEED AUTOMATIC Transmission w/Dual Shift Mode A/T 10-Speed A/T RUBY RED METALLIC TINTED CLEARCOAT EQUIPMENT GROUP 502A LUXURY Heated Rear Seat(s) Variable Speed Intermittent Wipers Integrated Turn Signal Mirrors Chrome Wheels Navigation System Power Mirror(s) Heated Steering Wheel Intermittent Wipers Universal Garage Door Opener Heated Mirrors AM/FM Stereo Adjustable Steering Wheel Satellite Radio Tow Hooks Blind Spot Monitor Premium Sound System Power Folding Mirrors Cross-Traffic Alert Running Boards/Side Steps Rain Sensing Wipers BLACK, LEATHER-TRIMMED BUCKET SEATS Cooled Front Seat(s) Seat Memory Power Passenger Seat Power Driver Seat Heated Front Seat(s) Passenger Adjustable Lumbar Leather Seats Driver Adjustable Lumbar Bucket Seats LARIAT SPORT APPEARANCE PACKAGE Aluminum Wheels Running Boards/Side Steps ENGINE: 2.7L V6 ECOBOOST V6 Cylinder Engine Gasoline Fuel Turbocharged TIRES: LT275/65R18C OWL Tires - Rear All-Terrain Tires - Front All-Terrain TAILGATE STEP W/TAILGATE LIFT ASSIST INTEGRATED TRAILER BRAKE CONTROLLER 3.55 AXLE RATIO (STD) *Note - For third party subscriptions or services, please contact the dealer for more information. * Today's luxury vehicle is not just about opulence. It's about a perfect balance of performance, comfort and attention to detail. This 2019 Ford F-150 is the perfect example of the modern luxury. Equipped with 4WD, this Ford F-150 gives you added confidence to tackle the surface of any path you take. Added comfort with contemporary style is the leather interior to heighten the quality and craftsmanship for the Ford F-150 Enjoy the drive without worrying about directions thanks to the built-in navigation system. '18 F-150, Diesel 3.0L V6 Electronic 10=SPD Auto, Engine, SuperCrew, 145" WB, 3.55 Electronic Lock RR Axle, Lariat Series, Trailer Tow Pkg, Tailgate Step, Lariat Chrome Appearance Pkg., Leather Bucket seats with console, Wheel Well Liner Spray-In Bed Liner, Blind Sport Info System, LED Side-Mirror Spot Lights, B&O Play Premium Audio System, Voice-Activated Navigation, SYNC Connect, 2nd Row Heated Seats, Heated Steering Wheel, Located at Maple Creeks, Sk. contact Cory or Dale at 1-877-662-2617 or email them at cpenner@cypressmotors.com or dlockard@cypressmotors.com. We Finance! On site Banking Solutions! Ford Maintenance Protection Plan and Extended Ford Protect Plans Available One Stop Shop with Sales and Service, Serving Southwest Sk. for 45 years.